Vault of Horror number 37, first appearance of Drusilla. Comic is in low grade, centerfold is detached, tear in front cover and through several interior pages and comic is barely attached. Comic is complete. Planet Comics. More than 40 books. Up for auction is a golden age comic. Adventures into Terror Vol1 #6. The Return of the Brain. Current Detective stories Publisher. October 1951. Glossy cover with white pages. The cover has tattered edges. Also some paper loss at the bottom of the spine. There are some tears at the spine. Fair to good condition. New ListingPLANET COMICS #50 JOE DOOLIN COVER FICTION HOUSE 1947! Those are tough. COMIC GRADING : Grading comics is not as easy as it looks and things are almost always missed. If you buy a comic from us and get it professionally graded, we cannot be held responsible if you don’t get the grade you were expecting from CGC, CBCS, PGX or any other grading service you might use. The spine is not split and the staples are clean. The cover is detached from the top staple --- rest of book is all attached at both staples (weak at bottom cover, strong at centerfold). The covers are heavily tanned and thin, but not brittle. Tales From The Crypt No. 24, Jul-Aug, 1951, EC Comics, GD/VG 3.0, light spine wear, small bottom corner. Crypt of Terror 17 CGC 3.0 | EC 1950 | 1st issue! Johnny Craig! Al Feldstein! Up for your consideration is Crypt of Terror 17 CGC 3.0 | EC 1950 | 1st issue! Johnny Craig! Al Feldstein! . Lot of 1 Books containing; Crypt of Terror 17 CGC 3. MYSTERIOUS ADVENTURES #3 (1951) FINE-. White pages. Slightly rolled spine. Check out my other comics, and other items on eBay this week. WE ALSO ACCEPT PAYPAL! Shipping is $8.00 in contiguous U.S.A. including insurance. Thanks, Randy. This bright, solid example is certified at the CGC 4.0 tier. It has nice color, and has retained near newsstand-caliber Off-White to White Pages. 1954, Classic "Rack of Terror" cover. DARK MYSTERIES #19. CGC 6.5 Chamber Of Chills 24 Pre Code Horror Comic. Harvey Pubs. Classic pre code comic. Longtime Collector thinning out my books. Bid with confidence. All items packed extremely well and shipped immediately after payment via Priority Mail with insurance. Items selling over $500 (or upon request ) shipped with signature confirmation. Please pay within 24 hours of auctions end. I time them to end on days off for fastest shipping. All questions answered as quickly as possible. Thank you for looking. CGC Black Cat 47 Pre Code Horror Comic. Harvey publishing. Classic Lee Elias Cover. Off white pages Longtime Collector thinning out my books. Bid with confidence. All items packed extremely well and shipped immediately after payment via Priority Mail with insurance. Items selling over $500 (or upon request ) shipped with signature confirmation. Please pay within 24 hours of auctions end. I time them to end on days off for fastest shipping. All questions answered as quickly as possible. Thank you for looking. New ListingTALES FROM THE CRYPT #42 JACK DAVIS COVER EC COMICS 1954! New ListingTALES FROM THE CRYPT #28 AL FELDSTEIN COVER EC COMICS 1952! 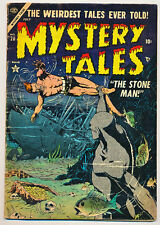 New ListingSTRANGE TALES #22 (ATLAS/MARVEL Golden Age Comic 9/1953) John Buscema, STAN LEE! All of the comics sold by the fine folks at The Kult Kitschen have been photographed against black fabric to prevent shadowing which can obscure defects. Our grading system is very strict and it’s consistency is ensured by the usage of a single professional grader who handles all of our books. Tales From The Crypt No. 21, Dec-Jan, 1951, EC Comics, GD 2.0, cover unattached, discoloration around staples. It helped him get hooked on collecting and still stands out in his mind among his favorite experiences in the hobby, he said. New ListingCRIME SUSPENSTORIES #27 FINAL ISSUE OF SERIES JACK KAMEN COVER! weird fantasy comics 14. Shipped with USPS First Class Package. 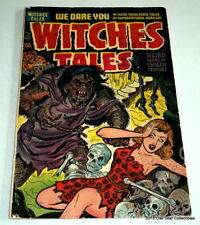 Weird Fantasy is a bi-monthly,dark fantasy and science fiction anthology comic book series published by EC comics. Beginning in May 1950 until December 1953, only 22 issues were made. This comic has not been graded but it is genuine and appears to be in very good/Fine condition. Tales From The Crypt No. 28, Feb-Mar, 1952, EC Comics, VG 4.5, light spine roll and wear, no split, stapled firmly. New ListingHAUNT OF FEAR #22 GRAHAM INGELS COVER EC COMICS 1953! Excellent vintage L.B. Cole horror comic ! No contracts were finalized. The line art is printed on an acetate sheet.it is hand painted on the back to render the printed inks opaque. the final effect is the stunning 3-D quality of an original animation sericel.This art is in near mint condition and is matted in white with a cardboard backing. This lot includes Strange Tales of the Unusual 1 2 3 4 5 6 8 9 10 11. These books are in general good/fair condition but are not without problems. #1 has a date stamp on the cover as well as chipping along the bottom edge and a tear on the cover about 3" long. Robot cover. Strange Worlds. Tape on spine. Also Priority rates below. Last Pre-code Issue. More than 40 books. Dark Mysteries #16 CGC 3.5 OW Pre-Code Horror-Hanging Noose! The grade is my best guess. Here are all the defects I can see. Wear and creases at spine. Tiny tear middle top edge. Tanning edges covers and page edges. First page has small tear bottom left at spine. The Vault of Horror #35 - Classic XMAS Cover!! This is a classic Johnny Craig cover and a tough to find book in any grade. The spine has normal wear as does the book. No chunks missing. Centerfold firmly attached. Colors inside the book and outside are very nice. Look at Pics to see defects. Stain near EC Logo. Corner fold seam upper right corner, Sticker removal tear between RO in Horror. Only very slight tanning around edges. Actually looks better than it sounds. Monster #1 Golden Age Comic GGA Fiction House 1953 Vg. Shipped with USPS First Class Package. Ships to continental U.S. only Any listed grades are opinion only. Combined shipping as follows 1-3 comics $3.99 4-7 comics $6.99 8-40 comics $15.99 Thanks for having a look! Out of the Night Comic Book.1953 by ACG.Clean Solid Condition. Strange Fantasy #1 1954. Very cool Golden Age horror. Cover is attached. "Terror Town" text story by John Martin. "Graveyard Terror"; A village idiot frees the monk of revenge from his grave; A padre goes to send the monk back to Satan; He succeeds by driving a cross into the monk's grave. Tales From The Crypt No. 25, Aug-Sep, 1954, EC Comics, GD 2.0, cover detached at top staple, edge wear. 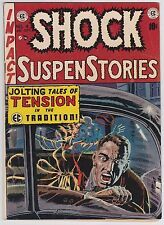 New ListingSHOCK SUSPENSTORIES #18 FINAL ISSUE OF SERIES GEORGE EVANS COVER EC COMICS 1954! Lily Renee cover and art. Hypodermic needle panel. Planet Comics #49 (Fiction House July 1947). One of the more difficult issues to find in the Planet run. The cover depicts one of the Werewolves from Hydra-Hell blasting through an underwater fortified chamber with her ray gun. 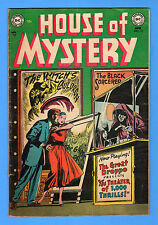 Web of Mystery #3 1951 Early Sekowsky Art! VG/VG+ 4.5 Ace Magazines TOUGH Book! BEWARE #15 (Merit -1955) GD 2.0 Low Grade Horror Rare! Weird Horrors #6 (1953) Ekgren artwork, Ultra SCARCE! Don't miss this one!